Dr. Stephen Paul launched his family practice 43 years ago after graduating from the University of Missouri - Kansas City School of Dentistry in 1974. He was born and raised here in the St. Louis area, where he met his lovely wife, Jane. They enjoy their time together with family and friends as well as caring for their animals at home. These fur babies include dogs, chickens, cats and horses. Dr. Paul's kindness and love for others is exhibited in the way he has taken in countless strays (people and animals) over the years. Long time employee and friend, Kathy Ferguson, says "Dr. Paul cares so much for his patients and others that he not only takes an interest in their dental health, but their personal lives as well. He takes the time to catch up with them when they come in so that everyone sees they matter to him." The fact that there are patients in this practice that have been coming to Dr. Paul for over 20 or even 30 years speaks extremely highly of his reputation in this city. Dr. Stephen Paul focuses on meeting his patient’s needs and creating an environment in his office that reflects that philosophy. His peers have recognized this commitment by naming him one of the topDentists™ in the St. Louis area again this year for the ninth year in a row. The family practice Dr. Paul has built is a friendly, comfortable and caring environment. His team of professionals is focused on ensuring each patient’s individual needs are met. The team frequently attends continuing-education programs and seminars to enhance its professional knowledge to provide the ultimate in preventative and restorative care. Since launching his practice, Dr. Paul has provided cosmetic dentistry, veneers, crowns, implants, partial and full dentures, periodontics, temporomandibular joint disorder (TMJ) treatment, teeth whitening and dentistry for children. Still, prevention is at the heart of his dental philosophy. The office has the latest in digital technology, lasers and intraoral cameras. Intraoral photographs can be viewed on TVs mounted in each treatment room to enlighten the patient about their dental needs and allow them to see, first-hand, improvements dental treatment has provided. He also offer nitrous oxide/oxygen analgesia for his patients. 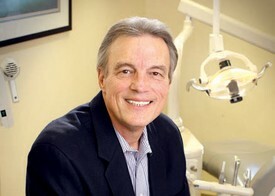 A graduate of the University of Missouri-Kansas City School of Dentistry, Dr. Paul is a member of the American Dental Association, the Greater St. Louis Dental Society and the Missouri Dental Association. He also continues to volunteer on an advisory board for the Special School District’s South County Technical School, as he has for many years.